I am an account owner. How do I set up other system administrators? The MANAGE ACCOUNT tab is where you go to add or manage system administrators. If you do not have an Enterprise package, you will not have this tab visible to you. 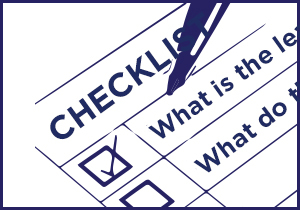 How do I know the status of my software license? All your subscription info is located in the lower right side of your main menu screen. If you exceed your package limits, you can contact your BLP account manager to expand your package. Alternately, you can delete authors, players, or game shells, depending on what limit you are exceeding. 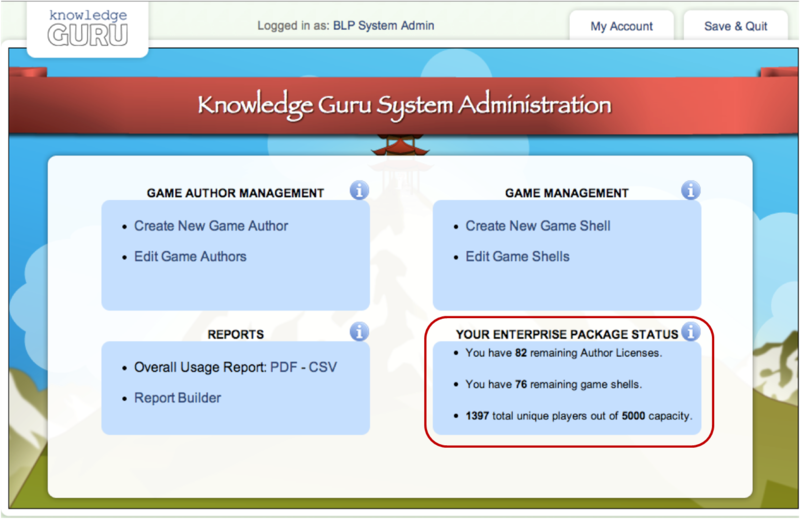 What are the different roles within Knowledge Guru: account owner, system admin, game author, player? You can set up others in your organization to be system administrators. This privilege is only available in Enterprise packages. In all other packages (Starter, Standard, Premium), the account owner also functions as the sole system administrator for Knowledge Guru. 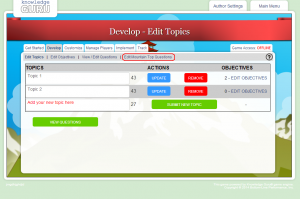 Create and edit game authors (which includes deleting an author). Resend an author the login details for a game shell he or she has been assigned. Create and edit game shells for Drive, Quest, or Legend game types (which includes deleting a game that is no longer needed). Log into any game shell and have all the same privileges as a game author while you are in the shell. View and generate system-wide reports that show usage across all games that have been created. Verify details of your software package and monitor your package’s status (expiration date, player count, game shell, author licenses used). Locate an email address for your BLP account manager in case you need to reach them with a question. Customize a game shell via the GAME SETTINGS tab. Add or edit game content (topics, learning objectives, and questions in Legend or Quest; topics, objectives, and mini-games in Drive). View or download a variety of reports. Select the leader boards players see in the game. 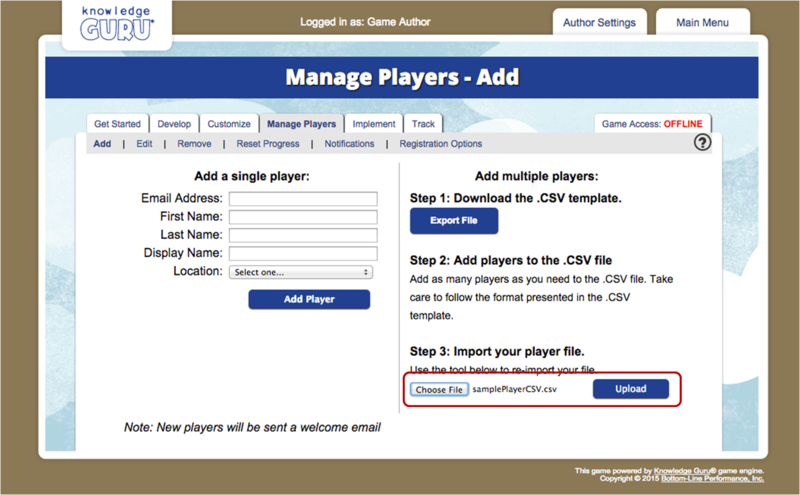 Manage players (add, edit, delete). Select a player registration option. Set auto deletion of player data or player accounts for a specific time point. Take a game on or offline. Send emails to all of a game’s registered players. Set up automated reporting to specific email addresses. A player can register for and play a Knowledge Guru game to which he or she has received an invitation. Once a player logs into a game, he or she can view leaderboards and access a Standings screen as well as play the game itself and track progress through the game. What is a game author? What is a "game shell?" A game shell is a game that does not yet have content in it and hasn’t been made “live.” Every game starts out as an empty shell that an author has to populate and then convert from offline status to online status. The Game Author will determine if the game shell should be for a Drive game, a Quest game, or a Legend game. I am trying to make a game shell, and the site won’t let me. A game shell has to have an author assigned to it. If you try to set up a game shell and you haven’t created at least one author, the system won’t let you. Can I change my game’s name after I create it? Choose a game to edit from the drop-down list available and then click EDIT GAME. Type over the game name visible in the GAME NAME field. If you also want to change the game’s URL, change that information as well. You should see a verification message on the screen. How do I delete a game I no longer want? Select EDIT GAME SHELLS from the Main Menu. Choose the game you want to delete from the drop-down list of games. What is the difference between the reports available in System Administration and the reports available within a game shell? At the system administration level, you can generate reports that let you see overall statistics or usage across all the game shells you have in your system. At the game author level, you can generate a report about an individual game and get performance data about individual players as well as aggregate performance data across the entire pool of learners or a specific subset of learners (based on any customized user registration fields you created). What’s the difference between a Drive game and a Quest game? 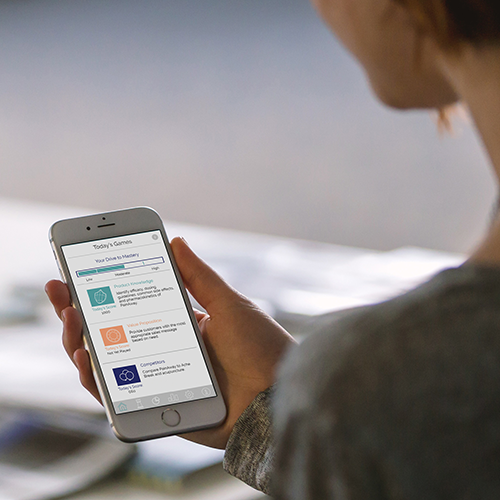 Each app in the Knowledge Guru platform is optimized for a certain audience, a certain type of learning, or a certain work environment. Drive is designed specifically for post-training support. It is also targeted specifically to use on a smartphone. Gameplay occurs over several days with each gameplay experience lasting approximately 5 minutes. It has robust analytics for both players and managers and tracks mastery of topics and objectives as well as confidence levels in performing objectives. Quest combines immersive game mechanics with a multi-day play experience that occurs in short bursts over time. 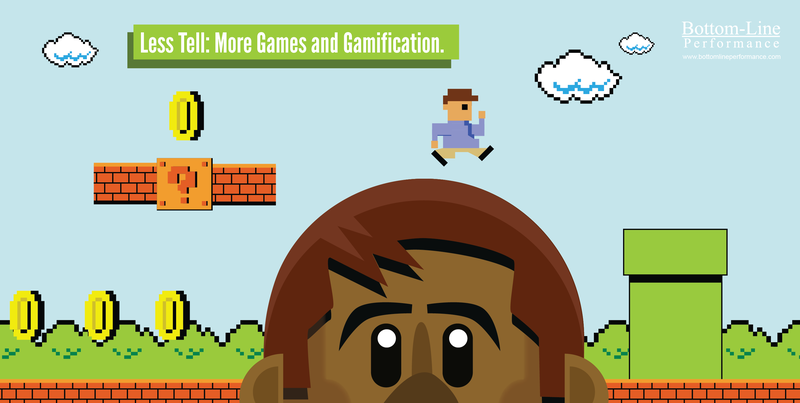 It can also include performance challenges that build higher-level skills. I want to upload lots of players and pre-register them for game play. Can I do this? When should I delete player data? All packages have a maximum limit on the total number of players you can have. Therefore, it makes sense for you to keep the player data “clean” by periodically removing players who are no longer actively playing a game. What question types can I create? Am I limited to multiple-choice questions? Legend allows you to create multiple-choice questions, true/false questions. 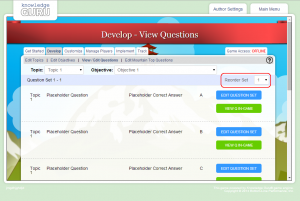 Quest allows several question types including multiple-choice, true/false, select all that apply, and ranking. In addition, with Quest you can include links to videos or resources. Drive experiences let you choose between different mini-games. Can I make a word or phrase bold? You can boldface or italicize words in the Legend and Quest games. You must use HTML tagging to do it. < strong >word or phrase you want in bold< /strong > (remove spaces in <> markup). In a Quest game, you use the following code for bold-face: [b]your text[/b]. For italic you use this code: [i]your text[/i]. Can I re-order my topics after I create them? No. This means it is very important that you are confident in the topic order when you create it. You can rename a topic and you can delete a topic, but you cannot move topics around. Can I re-order objectives within a topic? 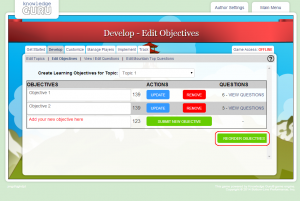 Click REORDER OBJECTIVES in lower right, beneath list of objectives. You will be able to identify how you want to re-order the objectives. Can I move objectives from one topic to another one? No. You cannot move objectives between topics. Can I change the order of my question sets? Use the dropdown list to select the OBJECTIVE whose question sets you want to reorder. Can I move a question set from one topic to another one? Can I associate a question set with a different objective? Why does a player get the same question they just answered if they make a mistake? Can I change this? When players make a mistake or a “misstep” in a Guru game, they receive immediate feedback on the mistake. When they click CONTINUE, they will start with the question they just missed, but the response choices will be randomized. This requirement that they immediately try the question again is a deliberate instructional design choice that is research-based. 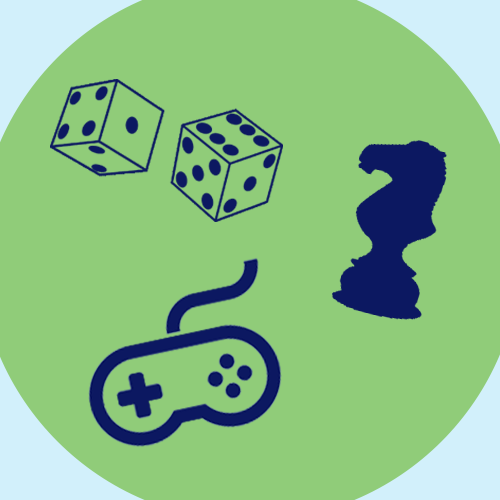 By requiring the player to immediately re-answer the same question, we introduce repetition AND we require them to get it right before moving to a new question, which helps embed the information correctly. You cannot change this game feature. Do players see feedback if they respond correctly to a question? In a Legend game, their score will adjust upward, and they receive a new question. In a Quest game, a player sees a point value flash on the screen and add to their total score. These are subtle, yet important pieces of feedback that affirm the player answered correctly. In Drive experiences, players always see a summary of correct responses to all items at the conclusion of the mini-game. In Legend games, what is the "Mountaintop question?" 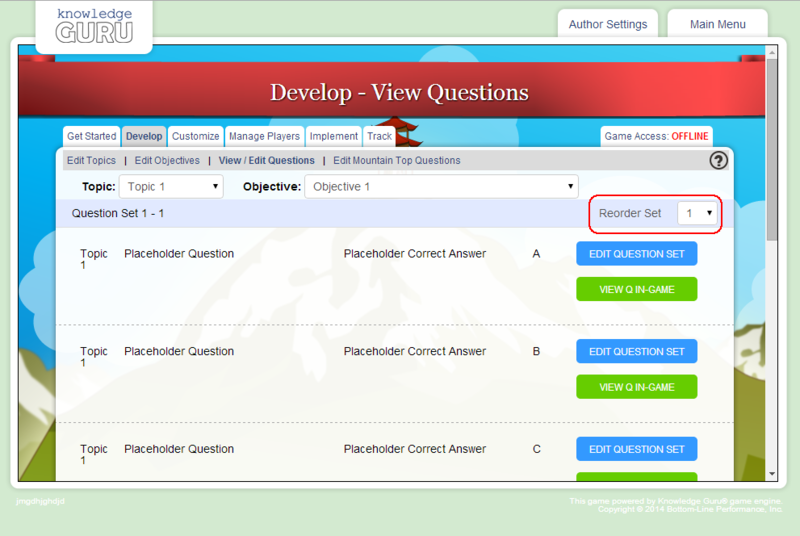 The Mountaintop question is a “final” question that players only see after they complete their third path within a topic. A Mountaintop question is only found in a Legends game. It is designed to be a light-hearted question that players do not take seriously. I created my game and discovered I have placeholder text for a “mountaintop” question when a player finishes the third path in a topic? How do I fix this? From the Main Menu, select the DEVELOP tab. 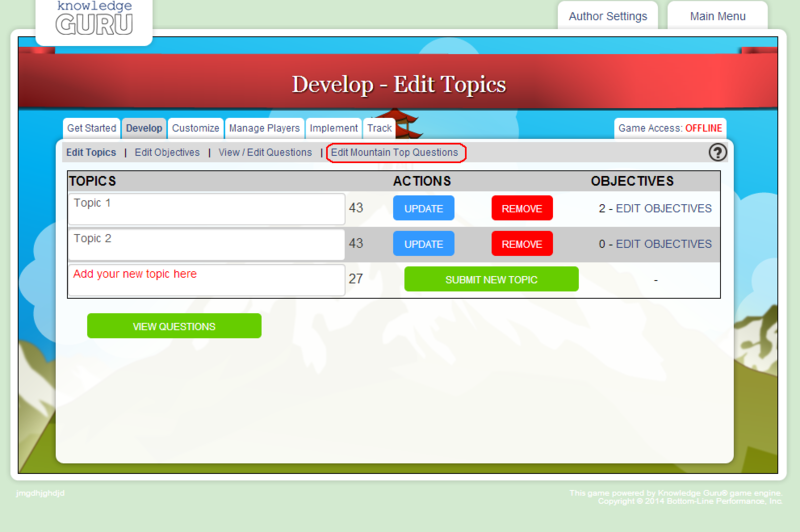 Then, select EDIT MOUNTAINTOP QUESTIONS. See the image below as a reference. How do I communicate the game’s existence to players? 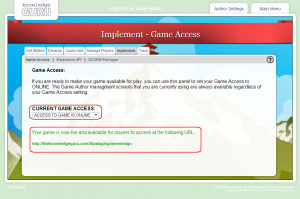 You need to provide players with a URL address so they can self-register for game play. When you develop your game, its GAME ACCESS is “offline.” When you toggle this status to ONLINE, the game URL will display underneath the IMPORTANT NOTE section of the Main Menu, as shown below. How do I access the game as a player? Go to the game’s URL and self-register. In either instance, you will get an auto-email from Knowledge Guru after you complete your registration that directs you to complete your game setup by verifying a password and/or email. Once you complete verification, you can then log into the game using your email and the password you created. How do players start playing? Player access depends on whether you pre-register them or whether they are self-registering. If you pre-regiser players by uploading names, emails, and a password, then you will need to email your players the URL, along with login instructions that include their user name and password. If you opt to have them self-register, you send them the URL only and instruct them to set up an account. With either method, players have the option of downloading a iOS or Android phone app to play Quest or Drive games. (Legend games are desktop or tablet only). We recommend players register for play on their desktop and then use the mobile app to play once they have finished their initial registration. Once my game is live and people are playing it, can I contribute to change my content? Yes. You can edit existing questions, but making structural changes to topics (adding/removing questions) will change completion data and likely require a reset of player progress in the game to avoid complications or errors. What’s a performance challenge in a Quest game? A performance challenge is an optional component to Quest games. These challenges are skill-based or activity-based events you have players complete in addition to responding to questions. Players cannot progress to a new world of play until they complete the performance challenges associated with a previous world. The challenges you include should relate to the game’s content. For example, if you designed a sales game, you might include a performance challenge that has players create an account plan for one account. You could include an account planning template as a resource they use to create their account plan.